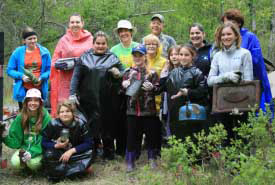 Several Nature Conservancy of Canada (NCC) projects in Manitoba rely on the time and creative talent of volunteers to help with a variety of tasks, from clearing land to organizing special events. Time dedicated varies from several hours, to one day, to longer-term commitments. NCC's Conservation Volunteers program engages people in the protection of Canada's biodiversity. The program provides a meaningful, hands-on, educational experience in important natural areas. Our events are carefully designed to ensure your volunteer time is dedicated to critical conservation activities. Conservation Volunteers can help staff on projects that contribute to the long-term management of properties owned and managed by NCC and our partners, right across Canada. To speak to the Conservation Volunteers coordinator in NCC's Manitoba Region, please contact us at manitoba@natureconservancy.ca or 1-866-683-6934.